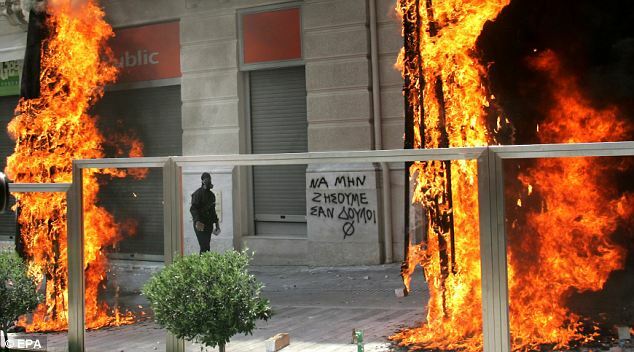 Protests in Athens turned violent again yesterday with ordinary Greeks protesting against their government's attempts to plunge Greece even further into debt to avoid the inevitable default on their national debt. Greece has already been bailed out once and with the latest proposed bailout, will owe the EU and the IMF €110bn just from the bailouts. The current proposed EU bailout of €12bn (plus a few billion more from the IMF which the UK will be contributing to despite Cameron's Cast Iron Promise™ that we would not be part of another Greek bailout) is conditional on the Greek government implementing a €28bn EU-approved austerity plan which 70% of Greeks oppose. The Greek government finds itself in a quite unique position in that the Greek people aren't asking their government to sort out their economy, they're demanding that they default on their debts and bankrupt the country. And why not? There is no way out of this for Greece, they will have to be bailed out over and over again until they default. They will be paying back the EU and the IMF for generations, if they can ever afford to pay them back at all. The British government has indebted our children and our grandchildren bailing out the Scottish banks but the Greeks are burying their grandchildren's children and grandchildren in debt. The only way out for Greece is to default on its debt, reject the EU's austerity plan, refuse any more bailouts and leave the Euro. You can't grow an economy if people don't have money in their pockets and you can't deal with rampant inflation or crippling exchange rates if your currency is pegged at a rate that suits Germany.